Subscribe for our Podcast today. 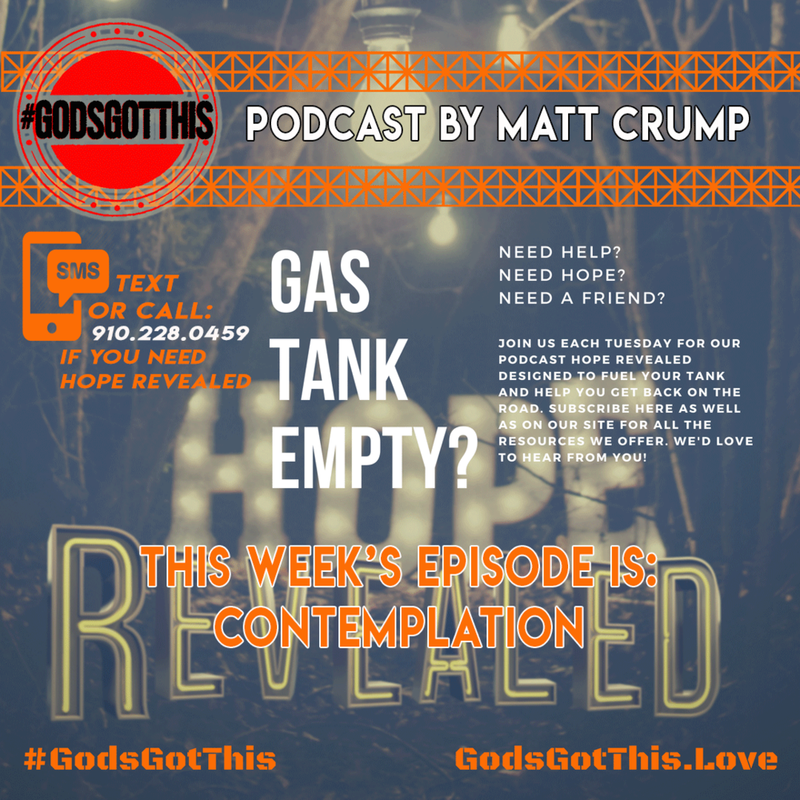 Visit https://www.godsgotthis.podbean.com or iTunes today. On this week's podcast, we are talked about contemplation and find some ways possible to look at the way you look at stuff. I hope you’ll stick around for the next few minutes and I look forward to hearing back from you after the show today. You see, contemplation (the deep thought of something) is a really wild stage of change.......and ambivalence,(mixed emotions) can make contemplation a forever feeling like an extremely frustrating condition. It can be something like a college student who doesn’t really know what he or she wants to do with their life, yet they are already in college and have to pick a major. It can be an incredible roller coaster of emotions laced with huge hills and fastly approaching valleys just to come up with one thing, but it’s a huge thing and becomes this major alright, I’ll say it.. a major contemplation. When dealing with contemplation, it is important to note that interest in change is NOT commitment. Tweet that! Mixed emotions or the fancy word ambivalence are the archenemies of commitment and a prime reason for that non-stop rollercoaster called contemplation. Some rollercoasters are a blast, but to get on one and not ever know when it will stop and not know when you can finally get off, well, that is no fun at all! Do you fully understand the range of both extrinsic and intrinsic motivators that brings you to this point of contemplation? The honest reflection looks at a situation for the truth that’s present, not just the truth you see. There are some ways to be able to do that and we’ll talk about that over the course of this week. If you had the opportunity to know your life was about to end, you are at peace with it and you could sum up everything you have learned about life into 3 words, what would they be? Contemplating a question like that can be quite hard for some. There are many issues around the answer as well as influence. That brings me to a point I’d like to discuss. It is called motivators. A recent article written by Kendra Cherry at VERWELLMIND.COM says this Extrinsic Motivation refers to behavior that is driven by external rewards such as money, fame, grades, and praise. This type of motivation arises from outside the individual, as opposed to intrinsic motivation. Kendra also writes that Intrinsic motivation refers to behavior that is driven by internal rewards. In other words, the motivation to engage in a behavior arises from within the individual because it is naturally satisfying to you. It’s super easy to move through the contemplation stage acknowledging only the extrinsic motivators that push you to change—but what about the intrinsic? So, let’s say you are listening today to this podcast or reading it on our blog because you really just wanted to look more into contemplation and thought it would be interesting and beneficial to you, that is INTRINSIC MOTIVATION. Let’s say your wife told you that she heard about this article and told you to read it so that you can start learning how to make up your mind or the marriage is over.. well, that is extreme, but you get the idea, that would be more of an EXTRINSIC MOTIVATOR. Okay, so here we are at the intersection of CONTEMPLATION and PEACE. The question I asked, in the beginning, today was, if you had the opportunity to know that your life was about to end, and you’re at peace with it and you could sum up everything you have learned about life into 3 words, what would they be? That is a hefty question for sure and definitely not one to just launch into a quick 3 words. It may actually take a bit of, dare I say.. CONTEMPLATION. There is something called the Transtheoretical Model and it was researched/studied back in the 70’s. The long story short of the Transtheoretical Model is it was a study of a bunch of smokers and the studies examed the experiences of smokers who quit on their own with those requiring further treatment to understand why some people were capable of quitting on their own. Ready for the powerful result? It was determined that people quit smoking if they were ready to do so. WOW! Really??!! Yes. Basically, if you make up your mind to do something, chances are, you will. 8 But Daniel made up his mind that he would not defile (taint, dishonor) himself with the [a]king’s finest food or with the wine which the king drank; so he asked the commander of the officials that he might [be excused so that he would] not defile himself. He made up his mind. That was a massive decision in the midst of a heated situation and several that he encountered. What made the difference in his life. Was he making choices based upon EXTRINSIC MOTIVATION or INTRINSIC MOTIVATION? By disciplining himself to live a certain way and to think a certain way, his responses end up being much different on the fly. Daniel didn’t just have this powerful miracle of a dynamic decision at that moment. He was a man of integrity. He fashioned himself to respond a certain way. He responded with humility. Daniel also teaches us that, no matter whom we are dealing with, no matter what their status is, we are to treat them with compassion. I wonder if Daniel wondered if he would ever hear something back about his plea. If he didn’t think so, why bother the plea. What’s even more awesome is that he was told that AT THE BEGINNING OF HIS PLEAS FOR MERCY…… A WORD WENT OUT. We may not always hear the answer to our pleas immediately, however, we can never give up hope that an answer will come. I would say that the contemplations of Daniel are contemplated upon an assurance of divine intervention. To have that assurance would have to change the posture of contemplation. It’s a contemplation with a strong resolve to hear a word from God. What have you been contemplating lately? Well, let me ask that a different way… How have you been contemplating lately? Even if the situation may seem like it’s not a spiritual one.. so... you’re contemplating what color to paint the living room, contemplating where you want to go eat for dinner, contemplating what fragrance you want in the smell good thing at the house.. whatever… Yes, It may not seem that every contemplation is serious or a high priority, however, the way you do it, is. When I was in the Army, we always had a saying, you will always do in war what you do in practice. I hated hearing that, but, the reality is, that is so true! Daniel was eventually so good at the way he contemplated things, it managed to get him in and OUT of a lion's den and to me, that’s a pretty big deal. Maybe you will have some time this week to study a bit about Daniel… Crack open the Bible and take a read and read through the lens that we have been talking about here. Okay, that’s about as far as we’ll go today, maybe you've left input this week through our Wednesday YouTube show, our Thursday Blog (Right here below) and Friday Devotion on YouTube. May today be the gift of excitement in your heart. May you dream the biggest dreams as your reduced to the biggest purpose of all, love. I hope that this week has been stirring something up in your heart and hope that the rest of this week’s ministry will continue to speak to your heart as well. When it does, would you take time to comment and share what God is speaking to you? It could change someone’s life forever!